Hayao Miyazaki is one of Japan's most beloved animation directors. In 2005 he was awarded the Venice International Film Festival's Golden Lion Award for Lifetime Achievement, and his Studio Ghibli received the festival's Osella Award for overall achievement in 2004. Miyazaki's films include Spirited Away, winner of the 2002 Academy Award® for Best Animated Feature Film, as well as Castle in the Sky, My Neighbor Totoro, Kiki's Delivery Service, Princess Mononoke, Howl's Moving Castle, and Ponyo, all of which have received great acclaim in the U.S. Miyazaki's other achievements include the highly regarded manga series Nausicaä of the Valley of the Wind and Starting Point: 1979-1996, a collection of essays, interviews, and memoirs that chronicle his early career and the development of his theories of animation. Both are published in English by VIZ Media. Enjoy reading the book and understanding the animation world in Miyazaki-san's mind. I won't go into detail, as most of the other reviews here are pretty accurate. I have to say, this is one of the most valuable books I have ever purchased. If you aspire to be an animator or a filmmaker or a storyteller of any kind, you should definitely buy this book. It's so unbelievably amazing. I can't wait to finish it and get the 2nd book. Love it! The only thing that saddens me is I thought the book would be filled with sketches and animations. But it isn't. 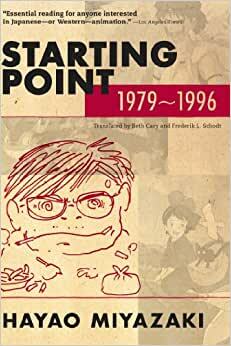 It's mainly essays from animators. Which is great because the animators go into such detail about animation styles, how Miyasaki inspired them, how he inspired Disney, what makes a good animator, struggles, etc...it's so so so detailed. It's truly a treasure. I love it. It's a gorgeous compilation on essays and interviews from the master himself. This is not an artbook, don't expect pages full of sketches or anything like that, this is about the ideas, the tips, the process. Though it has short coloured comic in the middle, with a couple of pages from Miyasaki's sketchbook. From the first's pages you can find some beautiful gems, useful for any comic artists, writer, animator; it's an enlightening piece. I bought this book as an artist trying to educate myself. There are very few pictures but the book is large! I love it and it is so inspiring I took notes after only reading a couple pages! I would highly recommend this for anyone who loves art, studio ghibli, or is just a bit curious about animation or the like, I love it! I attend more than a few director Q & A's at various film festival or Pacific Film Archive screenings. Inevitably someone asks the why, how, what-is-your theme, what-did-you-mean-by, what-do-you-want-us-think-when, why-did-this-character-do-that kind of question that directors and authors often decline to answer. Especially with respect to Totoro, both the film and manga versions of Nausicaa, Castle in the Sky, and Kiki, Miyazaki has addressed many such questions, sometimes in painstaking detail, in the decades of interviews and articles collected here. Though with room for error, readers can piece together Miyazaki's creative process and begin to understand how and why the characters he creates differ from those of any other animator. Offhand, I can think of only two works of similar scope and value: Bresson's Notes sur le cinematographe (Folio) (French Edition)(Folio: 1995) and Cocteau's Beauty and the Beast: Diary of a Film (Dover: 1972).